A wide-ranging exploration of whether or not choosing to procreate can be morally justified -- and if so, how. In contemporary Western society, people are more often called upon to justify the choice not to have children than they are to supply reasons for having them. 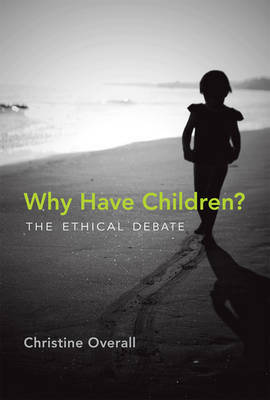 In this book, Christine Overall maintains that the burden of proof should be reversed: that the choice to have children calls for more careful justification and reasoning than the choice not to. Arguing that the choice to have children is not just a prudential or pragmatic decision but one with ethical repercussions, Overall offers a wide-ranging exploration of how we might think systematically and deeply about this fundamental aspect of human life. Writing from a feminist perspective, she also acknowledges the inevitably gendered nature of the decision; the choice has different meanings, implications, and risks for women than it has for men. After considering a series of ethical approaches to procreation, and finding them inadequate or incomplete, Overall offers instead a novel argument. Exploring the nature of the biological parent-child relationship -- which is not only genetic but also psychological, physical, intellectual, and moral -- she argues that the formation of that relationship is the best possible reason for choosing to have a child.